Primary Education Board DPE has announced a notice about PSC- Ebtedayee Exam 2017 on 20 July 2017. Directorate of Primary Education (DPE) has published PSC Exam Routine 2017 . 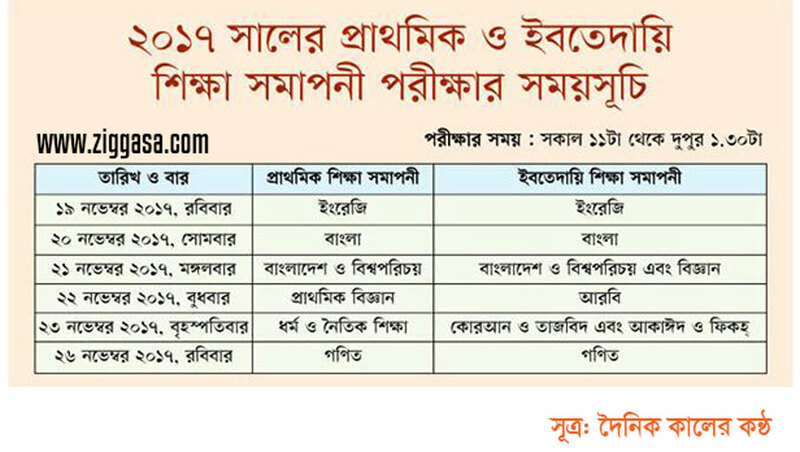 PSC Exam Routine & other information is available on DPE website http://www.dpe.gov.bd. PSC- Primary School Certificate Exam 2017 and Ebetadayee- Madrasha Primary Education Completion exam will be started on same day. PSC exam 2017 will begin from Sunday, 19 November, 2017 and it will continue till Sunday, 26 November, 2017. The decision was taken at a meeting chaired by Primary and Mass Education Minister Mostafizur Rahman at secretariat on July 18. Details PSC & Ebtedayee exam 2017 has also been announced. Every year a huge number of students appear in the PSC Exam. This year a huge number of students will also appear in the PSC and EBT Exam 2017. Last year 32,30,288 examinees attended in the PSC Exam 2016. PSC exam is managed by Directorate of Primary Education Bangladesh.